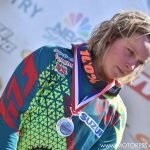 The ONSIA Sound Art Women’s Motocross Championship (WMX) rolled into Las Vegas as part of the AMSOIL Arenacross series. This was Round Four of the eight-round series, and although the Arenacross format was a bit different than their conventional two-moto motocross format, a full gate of the fastest women motocross racers in the country were on hand to take on the challenge – including two-time and current WMX champion Kylie Fasnacht. 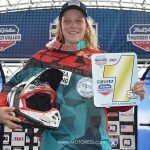 Kylie Fasnacht has been the most consistent finisher, earning more MyLucasOil.com holeshots and overall wins to date. Australia’s Mackenzie Tricker finished 2nd followed by Brandy Richards. In Heat 2, Eve Brodeur took the holeshot followed by Shelby Rolen who went on to lead the first couple laps with Fasnacht in tow. It was obvious both riders had previous Arenacross experience – or it at least it looked like it as they proceeded to cut inside each other, banging bars and putting on a great show for the crowd. Fasnacht took the heat race win, followed by Rolen, Amanda Brown and Marissa Polencheck. The stage was now set for the main event with 16 women representing 11 different states and Canada. It was a ten-lap main event with Fasnacht grabbing the MyLucasOil.com holeshot followed by Rolen, Woods and Richards. By the end of lap two, Richards worked her way up to second and Tricker, who was buried back in the pack off the start, quickly caught up to third followed by Rolen. While Fasnacht set the pace out front, Richards and Tricker started trading 2nd and 3rd place positions. Tricker eventually got by Richards and made it stick, setting her sights on Fasnacht, but the current WMX champion was too far in front to reel in and took the overall win. Tricker finished second, Richards third and Rolen put in a solid, consistent ride, finishing fourth. Eve Brodeur finished 5th followed by Carrie Killebrew, Lauren Woods and Jamie Astudillo, who took a serious header in the whoops during her heat race and soldiered through a wrist and hand injury to earn valuable series points. Kylie Fasnacht now has a solid lead in the WMX points standings, followed by Astudillo and Canada’s Eve Brodeur. 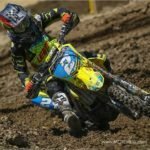 Round five of the WMX series will be held in conjunction with the first round of the Lucas Oil AMA Pro Motocross Series at the annual Hangtown Classic opener in Rancho Cordova, California, on Friday, May 19. 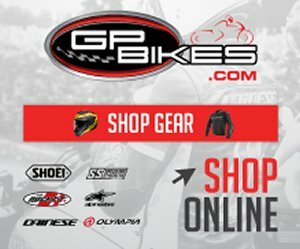 The Women’s Professional Motocross Championship (WMX), an AMA National Championship, features the world’s fastest female outdoor motocross racers. The 8-round series begins with the Ricky Carmichael Amateur Supercross at Daytona International Speedway in March and concludes at the Loretta Lynn Ranch in August.